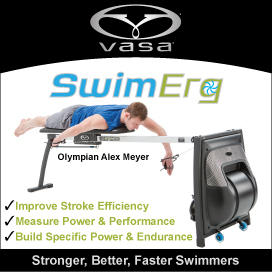 be competitive in the Virginia Triathlon Series - mostly sprints but finishing up with an Olympic distance race. The area with the greatest potential for improvement is swimming - technique (over-rotation issue), endurance, and confidence. Of course I'd like to improve the whole package of cycling, running, and transitions too, but I'm not sure how to really translate that into measurable goals. Get more consistent with good daily nutrition (I tend to slip post-race for a while). Develop a consistent strategy for long run fueling and hydration and stick to it. Strengthen lower legs which tend to be a weak link. Pay attention to injuries and address them early on. Practice replacing bike tubes and learn how to adjust shifter cables. Minimize daily stress, shed things, take on less, just say no! Another thing we have started is one-armed pushups. It would be fun to be able to do those!! Some of Robert's colleagues were discussing spousal Christmas presents. I don't know what the other wives will be receiving under their trees, but Robert said he was the only one who got a wetsuit for his spouse! (Due to the return policy, I *had* to try it on right away!) 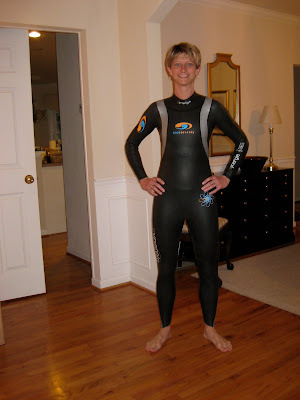 Tis the season for last year's triathlon wetsuits to go on major clearance to make room for the 2010 models. Back in October, Anne Jones, who has a triathlon coaching business, posted on Facebook, "Next summer's victories begin now." I was reminded of this last week, when I put in an hour of running in the pre-dawn darkness that was further shrouded by a very cold and steady rain. I told Jake I thought I deserved "bonus points" for such a run! To that he replied, "You ought to be grateful. Mornings like this I call separation days. How many of your competitors do you think stayed in bed this morning because of the weather? Because you still worked out you put a greater separation between yourself and everyone else. Be grateful." My only objective right now is to make those small but consistent deposits in the strength and endurance bank. There is no "cramming" in sport. And at the right time, I'll be cashing in on those deposits!! The VMI Classic was held in the beautiful campus gymnasium that had an elevated indoor track and a large, well-equipped amazing gym in the basement. It was the kind of gym where a lot of weight gets moved and a lot of work gets done -- no fluffy Gold's gym here!! In the early 90s, for several years, I competed in powerlifting (squat, bench, deadlift). 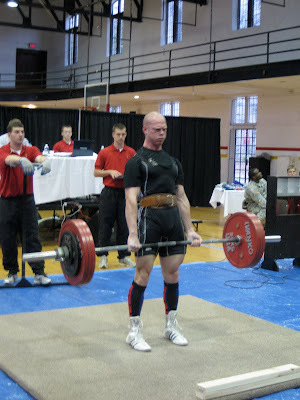 Since I enjoy lifting and strength training and have been working out consistently and aggressively with Jake in the gym for 18 months with many of the basic lifts, it made sense to try out another strength meet when one (drug-free of course) popped up close by at Virginia Military Institute (VMI). Jake went to compete in the deadlift portion, and I ended up doing the push-pull which was bench and deadlift. Powerlifting and running/endurance sports are two very different sports that require almost opposite training approaches and physiques. My gifts may be more with endurance sports and running, but strength training helps my other activities and gives me a degree of confidence that carries over into other aspects of life. And while I might not have the ideal powerlifting genetics, I believe technique and consistent hard work go a long way toward compensating. So...back to the meet. This meet was close on the heels of the Richmond Marathon so compromises were made with training -- namely not a lot of deadlifting. Until the preceding week, I wasn't sure if I'd deadlift at this meet but things had been feeling good. Deadlift is my favorite of the lifts for its clean simplicity. The week was spent shedding a couple pounds to get to the 123 weight class (I was 122 at the meet, 125-6 leading into it). We started the day checking weight at the Weight Club. I was fine and Jake did some cardio to sweat off his final bit of weight. We drove up to Lexington in a moderate pre-dawn snowfall and arrived for weigh-ins and an equipment check. We discovered that we needed tall knee-length socks for deadlifts and didn't have any. The meet manager gave us one pair from the raffle table (thanks!!) and I was able to borrow a cool pair of skull socks from Bettina Altizer, a world champion powerlifter. I knew Bettina from my old powerlifting days. She has a mind-boggling 451 squat and a 418 deadlift. Bettina said a few years ago she got a 320 lb bench - at a bodyweight of somewhere in the 130s. She's a Roanoke area lawyer too, just a great person, and coaching a few master's female lifters. So I felt like it was pretty good karma to be wearing the socks of such a successful lifter. After weigh-ins, the meet began with eating, coffee, and a lot of waiting. The meet started just after 10 and it was mid-afternoon before I was up for bench. I was not very patient. The way things worked, I was in the last flight of bench, and then Jake and I were both in the first flight of deadlift so as he was warming up for deadlift, I'd be benching. Bench was a bit of a disaster. I was opening with 121 lbs. As the day wore on I was second-guessing that decision, which may have contributed to the disaster-ness. Once you open the door of doubt, it's hard to close it again. The long wait and many hours of surging adrenaline that left me feeling depleted didn't help matters either. I missed my opening attempt at 121, I just got out of my groove and it angled back, my elbows flared, and there was no way to recover. I was so pumped for the second try at 121 that I launched if off my chest before getting the command to "press." Two missed attempts, only one remaining. Jake was two floors below warming up for his deadlifts which were to start right after my bench. The plan was for him to come up for my third attempt, assuming the first two would be no problem. I let him know what was happening. He came up, helped me regroup, and gave me a perfect lift-off resulting in a successful final attempt- solid and strong. I've never missed an opening lift before, but it was still a good learning experience. And I didn't give up. We went right into the deadlifts, and I noticed that my name had not been called as expected in the rotation. It turned out my card had been left out so I was added to the end of the first attempts, then put back into the rotation properly (they go lightest lift to heaviest) which meant very little time between my first two attempts. I opened with a comfortable 217 lbs, jumped to 231 lbs, and then had a longer break before a final and successful 242.5. Jake nailed all of his lifts too, making them look very easy, and finishing with a 468 lb lift at 165 lbs bodyweight. As with running, the powerlifting community is very supportive and friendly. You're competing to meet or exceed your own goals with an intense focusing of mental and physical strength for a fleeting instant. The spectators and participants wish for successful lifts for everyone and shout encouragement to any lifter who needs it. The brief but intense period of effort is in dramatic contrast to a race where you are maintaining physical effort and mental focus for a long period of time, over 20 minutes for just a 5K and up to several hours for a marathon. It was a long day, but a fun way to wrap up competitions for 2009. And I look forward to improving my bench PR at February's bench press meet at VT!